Ribbed Anti Vibration Cast Iron Body (C.I) For Vibration Free Printing. Infeed And Outfeed System Provided To Maintain Tension & Good Registration. Silent Air Drying System Fitted With High Velocity Centrifugal Fan. Flexo Printing Plant in Ocean Rotoflex the first Flexographic Printing Machines in modulate design with arched bridge Stack Type. With many years of worthy experience let this model stand out for its economic efficiency and high precision printing. The continuous up-dating and improvements carry out to the high versatility and easy operation, particularly for rather long printing runs on all extensible plastic film. Therefore we consider this flexographic printing machine as the most successful one in the world markets. Hydraulic Lift of plate cylinder with continuous rotation of inking rollers. Web compensating system for non stop printing of machine. Flexographic Printing Services The First Flexographic Printing Machines in modulate design with arched bridge Stack Type. With many years of worthy experience let this model stand out for its economic efficiency and high precision printing. The most advanced generation of super high speed, stack type flexo printing machine crystallized by our R&D team’s endeavor work from years of evolution in printing industry. The machines are designed with economical materials for ink rollers, doctor blade and printing rollers. The advantage of this series satisfy obverse and reverse printing needs while achieving the shortest production time, enhanced productivity, and lower costs. The machine is suitable for printing LDPE/HMHDPE/PP Film and Paper. The modern day Rotogravure Printing Machine Plant press uses a printing cylinder which has been laser engraved with minute cells capable of retaining ink, the size and pattern of which reflect the required image. These cells are forced to transfer their ink directly onto the substrate by a combination of pressure and capillary action, so producing the printed image. The process, also commonly called gravure printing, is used in the manufacturing of food and non-food packaging, as well as labels, wall coverings, transfer printing, and has a variety of further applications in the security printing, industrial, and segments of industry. We have earned strong presence in the domestic and international market by consistently manufacturing and exporting a quality range of Flexo Graphic Printing Process. This machine range is manufactured at our fully incorporated production unit by making use of unmatched quality cast iron and cutting-edge technologies. Our offered 4 Color Flexographic Printing Machine is utilized to print glass paper, roll paper, PE bags and PP bags in two color patterns for packaging items in supermarket, food and garment industry. High Speed Flexo Graphic Printing Machine, Flexo Machine & Gehlot Printing Machine are industrial machines meant for package printing using highly volatile fast dry inks and flexible rubber relief plates. 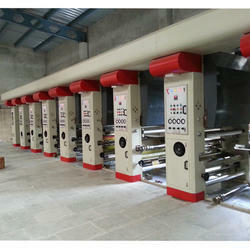 These two color flexographic printing machines are suitable for printing on HM, LDPE, PP, HDPE, aluminum foil, paper etc. It is available in three printing colors specifications and consumes less electricity in comparison to its efficiency. Four Color Flexographic Printing Machine is a technically advanced array of flexographic machine which can print in four different colors in a same time. This four color flexographic printing machine is highly appreciated amongst customers for its less electricity consumption, high speed running, automatic features, easy operation and noiseless performance. This four color flexographic printing machine is generally demanded in various industries for printing of plastic materials which are used for packaging purposes such as polypropylene and polyethylene foils etc. We introduce a technically advanced range of Six Color Flexographic Printing Machine. This six color flexographic printing machine is known for its high speed printing, accurate color registration and easy operation. It evenly prints all over the surface with no fade and dark patches of ink. This six color flexographic printing machine is widely used for printing of flexible packaging such as high density polyethylene, low density polyethylene, paper, polypropylene etc. We have earned strong presence in the domestic and international market by consistently manufacturing and exporting a quality range of Flexo Graphic Printing Machine plant. This machine range is manufactured at our fully incorporated production unit by making use of unmatched quality cast iron and cutting-edge technologies. Our offered 4 Color Flexographic Printing Machine is utilized to print glass paper, roll paper, PE bags and PP bags in two color patterns for packaging items in supermarket, food and garment industry. MS Flexographic Printing Machine in Ahmedabad the most advanced generation of super high speed, stack type flexo printing machine crystallized by our R&D team’s endeavor work from years of evolution in printing industry. The machines are designed with economical materials for ink rollers, doctor blade and printing rollers. The advantage of this series satisfy obverse and reverse printing needs while achieving the shortest production time, enhanced productivity, and lower costs. Flexographic Printing Presses in Gujarat Two Color Flexographic Printing Machines, Flexo Machine & Gehlot Printing Machine are industrial machines meant for package printing using highly volatile fast dry inks and flexible rubber relief plates. These two color flexographic printing machines are suitable for printing on HM, LDPE, PP, HDPE, aluminum foil, paper etc. It is available in three printing colors specifications and consumes less electricity in comparison to its efficiency. Double Side Flexo Printing Machine the most advanced generation of super high speed, stack type flexo printing machine crystallized by our R&D team’s endeavor work from years of evolution in printing industry. The machines are designed with economical materials for ink rollers, doctor blade and printing rollers. The advantage of this series satisfy obverse and reverse printing needs while achieving the shortest production time, enhanced productivity, and lower costs. Four Color Flexographic Printing Machine is a technically advanced array of flexographic machine which can print in four different colors in a same time. This four color flexographic printing machine is highly appreciated amongst customers for its less electricity consumption, high speed running, automatic features, easy operation and noiseless performance. This four color flexographic printing machine is generally demanded in various industries for printing of plastic materials which are used for packaging purposes such as polypropylene and polyethylene foils etc. We introduce a technically advanced range of Six Color Flexographic Printing Machine. This six color flexographic printing machine is known for its high speed printing, accurate color registration and easy operation. It evenly prints all over the surface with no fade and dark patches of ink. This six color flexographic printing machine is widely used for printing of flexible packaging such as high density polyethylene, low density polyethylene, paper, polypropylene etc. The programmable AC imported drive driven Flexographic printing machine with sturdy design, allow the optimum speed, stability and easy operations. 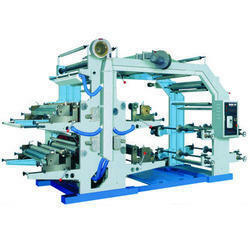 Elegantly designed, state of the art machine with practically tolerance free format setting ensure reduced film waste. Automatic Tension Control System: Load Cell feed back control provided on Unwind, Infeed, Outfeed& Rewind Station to maintain uniform tension throughout the entire roll. 1 to 8 Color Flexo Graphic Printing MachineThe first Flexo Printing Machines in modulate design with arched bridge Stack Type. With many years of worthy experience let this model stand out for its economic efficiency and high precision printing. The Flexographic printing machine runs up to 80 meters / minute and is suitable for 2, 4, 6, & 8 Colors HDPE / LLDPE / LDPE / PP / BOPP / Non woven Printed Roll. Provided for continuous rotation of Inking Rollers and Auto Lifting of Plate Cylinders when machine is printing in OFF mode. This prevents drying of inks on the Anilox Roller. For uniform & controlled ink supply on the Anilox Roll. Higher mesh laser engraved Anilox rollers for precise transfer of ink to achieve better and enhanced print quality. Air operated pumps for controlled circulation of ink between Ink Tank & Chambered Doctor Blade. Web Inspection System, equipped with high quality color camera, Quick Zoom & Split Screen, mounted on motorised traverse bar to monitor complete print at all speeds. Provided on Unwind and Rewind Station for quick and easy loading and unloading of the Parent roll. To maintain uniform & precise tension at printing, infeed and outfeed stations. Flexo Printing Unit in Ahmedabad Provided for continuous rotation of Inking Rollers and Auto Lifting of Plate Cylinders when machine is printing in OFF mode. This prevents drying of inks on the Anilox Roller. We have earned strong presence in the domestic and international market by consistently manufacturing and exporting a quality range of 8 Color Flexo Printing Machine. This machine range is manufactured at our fully incorporated production unit by making use of unmatched quality cast iron and cutting-edge technologies. Our offered 4 Color Flexographic Printing Machine is utilized to print glass paper, roll paper, PE bags and PP bags in two color patterns for packaging items in supermarket, food and garment industry. All rolls are dynamically balanced and hard chrome plated. Automatic Flexo Printing Machine Manufacturer in Ahmedabad - Flexo Printing We have earned strong presence in the domestic and international market by consistently manufacturing and exporting a quality range of 4 Color Flexographic Printing Machine. This machine range is manufactured at our fully incorporated production unit by making use of unmatched quality cast iron and cutting-edge technologies. Our offered 4 Color Flexographic Printing Machine is utilized to print glass paper, roll paper, PE bags and PP bags in two color patterns for packaging items in supermarket, food and garment industry. Load Cell feed back control provided on Unwind, Infeed, Outfeed& Rewind Station to maintain uniform tension throughout the entire roll. 4 Color Flexo Printing Machine Provided for continuous rotation of Inking Rollers and Auto Lifting of Plate Cylinders when machine is printing in OFF mode. This prevents drying of inks on the Anilox Roller. Provided on Unwind and Rewind Station for quick and easy loading and unloading of the Parent roll. Pneumatically operated Nip Rollers to maintain uniform & precise tension at printing, infeed and outfeed stations. Flexo printing machine The first Flexographic Printing Machinesin modulate design with arched bridge Stack Type. With many years of worthy experience let this model stand out for its economic efficiency and high precision printing. Flexo Graphic Printing Unit in rotoflex ahmedabad the first flexo printing machines in modulate design with arched bridge stack type. With many years of worthy experience let this model stand out for its economic efficiency and high precision printing. The continuous up-dating and improvements carry out to the high versatility and easy operation, particularly for rather long printing runs on all extensible plastic film. Therefore we consider this flexographic printing machine as the most successful one in the world markets.